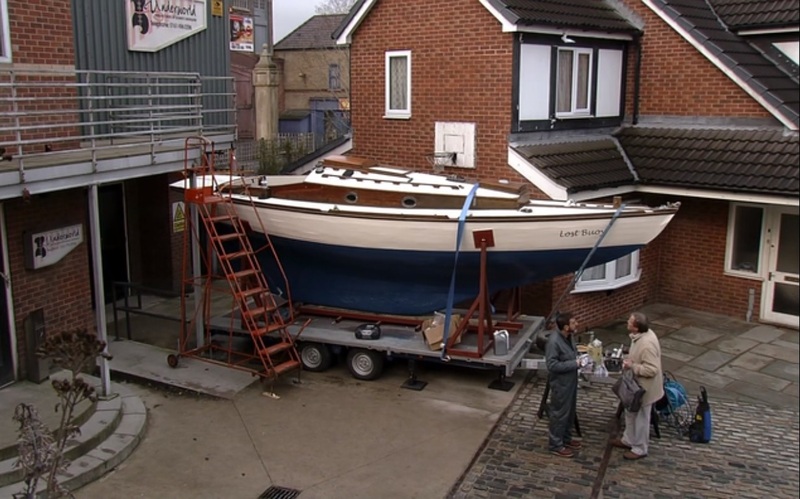 When Carla Connor gifted Peter Barlow a clapped out boat for Christmas, and agreed to let the gargantuan rust bucket sit outside Underworld while it was renovated, I did wonder what on earth was going on. Could anything be less Carla? But, as soon as the ‘Lost Buoy’ was installed in front of the Platts’ front door, I instead found myself asking, could anything be more Peter? Here, in no particular order, are nine reasons why Captain Barlow is the best sailor in dry dock. Okay, so they’re unlikely to have had Wrigleys Extra on the HMS Bounty. But, extended shots of Peter looking wistfully into the grey yonder atop his boat while philosophising, smoking or nurturing a minty chew has made him look every bit the navvy. She’s docked, me hearties, in the Underworld Loading Bay. Take the loading part out, and you’re basically left with the latest installment of Pirates of the Corriebean. Every skipper needs a trusty decky, and with son Simon in dire need of something useful to do, who better? But alas, Leanne Battersby plucked a crow on hearing about his plans to sail around the Caribbean with Peter for the summer, and revealed that Simon hadn’t been keeping up with his school work – a condition of any continued swashbuckling. And so that was the end of that, which fair took the wind out of young Simon’s sails. A bit more difficult in dry dock, but Peter has still managed to have two women on the go whilst not sailing the high seas. No sooner had Abi Franklin examined his engine than she was hired. Not just in it for the pieces-of-eight though, she then happily confined herself to close quarters where she swiftly ensured the games of cards took a back seat. 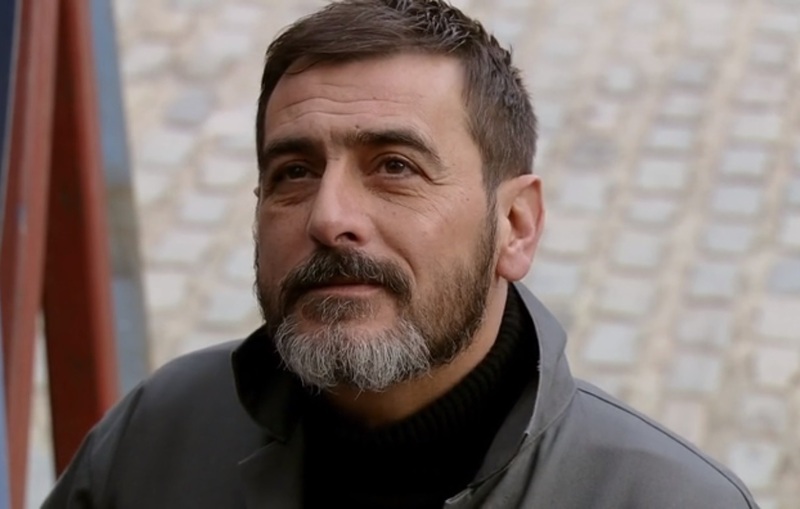 With Abi below deck, and windswept Carla looking down from the balcony of Underworld like Kate Winslet in Titanic, well, the cobbles may as well have dissolved to water. A blast of Celine D, anyone? No, Peter doesn’t have any rum aboard, for reasons apparent. Abi may have gone out in sympathy with a bottle of faux plonk, and taken a day off from keeping the good ship Rovers Return afloat by stealthily emptying barrels of Newton & Ridley. But, he looks every bit the sailor regardless, even with a brew. What sailor worth his sea salt doesn’t know his fools gold from his 24 karat? 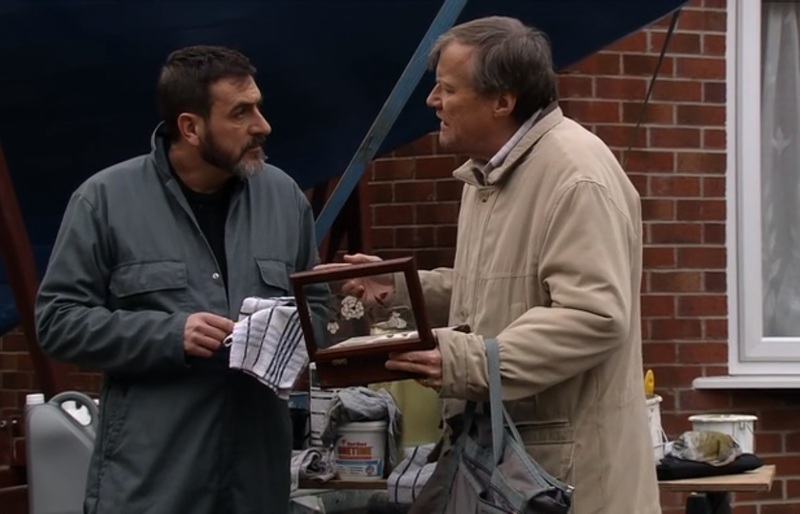 When Roy dropped by with a treasure trove of Sylvia’s jewels to ask which one he should gift to Carla, Peter didn’t so much as blink as he made his selection. A sailor’s tales are as vast as the ocean, and lie on the dark sea bed until awakened when the occasion demands. Peter looked to the stars as he told Simon about “Uncle” Ciaran’s salty shenanigans, because you never look directly at anyone when conveying your stories of a nautical nature. There was also a marvellous scene in which the Lost Buoy prompted grieving Roy to recall some childhood memories, and relate them to Peter. It was its own treasure trove of beautiful writing and fine performances, and I loved it. We’ve heard Captain Barlow use nautical terms like ‘land lubber’ to describe Gail, who conveniently forgets that Joe McIntyre was happily docked in the same spot so she can have a right moan every time she nips out for milk. But the sailor lingo is coming out in Peter in other ways too. Like quoting and amply impersonating hardened sea dog Quint from Jaws. He also displayed Quint’s tact, insulting Adam over both his unsuitability for a life at sea – “You’ve got city hands Mr. Barlow.” – and his chosen career – “That’s not workin’, it’s a slow death.” Well shiver me timbers! Tattoos are a must for any self-respecting sailor. 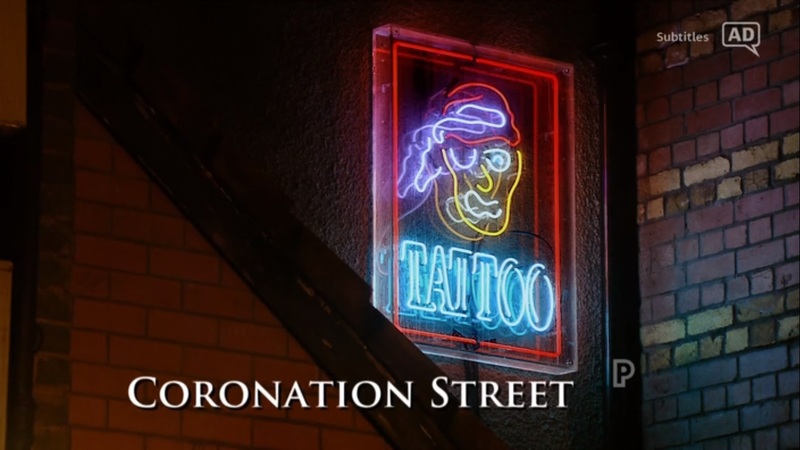 And while there may be a pirate on the Victoria Street Tattoo Parlour sign, we all know it’s not a place Peter Barlow needs to visit. He’s also swapped the Fred Perry for a fisherman’s sweater. I’m not sure I’ve ever seen him in one up to now, but the wool seems to have gotten chunkier and the roll necks bigger with each passing episode. He has also ditched the hipster hair for a cut more in keeping with a man of the sea. That’ll be a relief to Nick who will be spared the effort of having to come up with gurns and one liners to prod him with at the new barbers. Right now, Peter is probably looking wistfully north at the grey Manchester skies through a fog of his usual as he dreams of Kefalonia, and I for one am quite happy to let him. 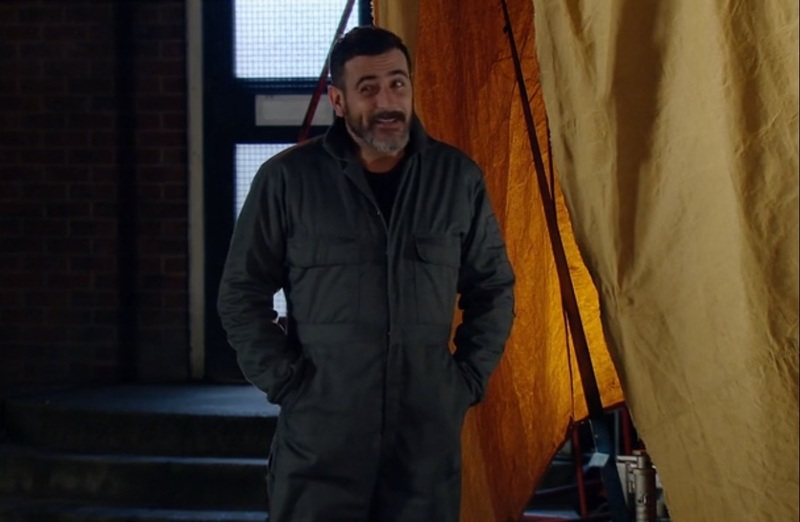 This blog also appears on the Coronation Street Blog.